Over the weekend, a lone hiker made a disturbing discovery: In New Zealand’s Mason Bay, more than 140 whales beached themselves and lay immobile on the sand. Half had already died whereas the other half was slowly fading. Because Mason’s Bay is located on New Zealand’s southernmost island and has a population of about 400 people, authorities decided that enough people couldn’t be gathered to help the whales in time. As a result, the two pods were euthanized. 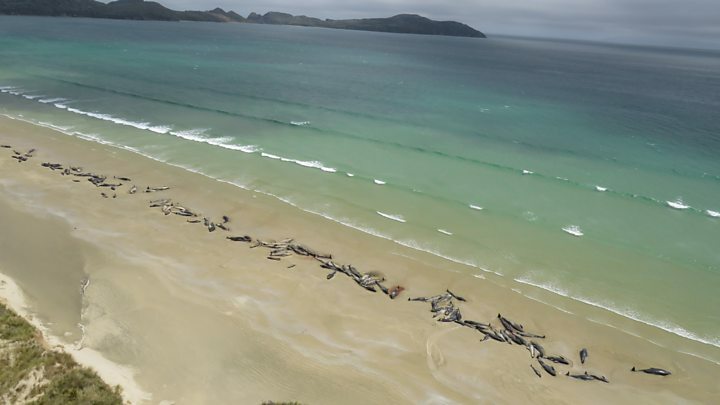 “Sadly, the likelihood of being able to successfully re-float the remaining whales was extremely low,” said Ren Leppens, the Rakiura operations manager for the New Zealand Department of Conservation (DOC), in a statement. According to the DOC, whale strandings are not uncommon in New Zealand. Each year, approximately 85 incidents occur. However, usually, only one whale beaches itself — not several at a time. To this day, scientists still don’t understand the obscure phenomenon. Hypothesis includes illness or injury that leaves whales at the mercy of strong ocean currents; an unexpected dart into shallow waters to escape predators or to pursue prey; and echolocation confusion due to humanity’s use of sonar and other EMF technologies. It is also worth noting that in two separate incidences over the weekend, 12 pygmy whales and a sperm whale also beached in New Zealand. Though four of the whales died, there is hope that the remaining eight can be rescued. Already, efforts are underway by the marine mammal charity Project Jonah. If the group is successful, it intends to re-float the whales on Tuesday; volunteers are being requested.